This is a small crack in one of the metatarsal (toe) bones, usually the 2nd or 3rd toe, and typically occurs in runners. There will be point tenderness over the area on examination. Treatment is rest for 6 weeks and using shoes with good arch support. Fracture of the heel bone. 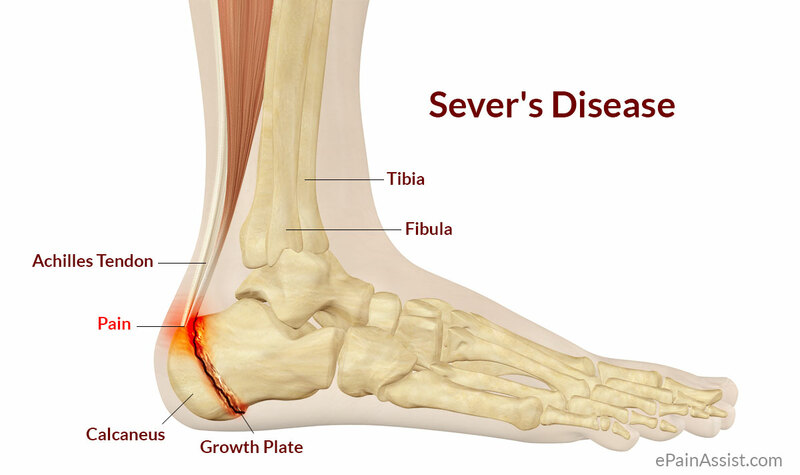 Occurs in athletes engaging in running sports, and is characterized by pain in the heel with walking or running. Pain can be elicited on exam by squeezing the heel bone. Imaging may be needed to make the diagnosis, and treatment is 8 weeks of immobilization. Inflammation of the bottom of the Achilles tendon where it attaches to the heel bone (calcaneus). It occurs in prepubescent boys, during exercise, in both lower legs. The treatment is RICE and shoes with good arch support, and will heal in about 2 months. Athletes will report morning heel pain after several hours of rest or during the first few steps of the day. The treatment is rest, and pain is gone after about 6 months.